Singapore undoubtedly surpasses its neighbouring countries and other leading nations worldwide in terms of executing business-friendly regulations, but the city-state is not fully shielded from inevitable headwinds brought by economic challenges overseas as well as evolving workforce needs especially in its key growth industries. The effects have been evident in the labour market. What should job seekers do to enhance their employability and become bankable? How can companies keep both foreign and local workers happy and productive? How can the government encourage companies to streamline their business activities according to the nation’s economic development plans? Meanwhile, the unemployment rate fell from 2.0% in September 2015 to 1.9% in December 2015. Given these numbers, MOM said there would be continued efforts to shape a more productive and manpower-lean economy. Tan Chuan-Jin, Minister for Social and Family Development, explained in 2015 that the tight labour market was brought by the exit of the baby boomers and the small population of the younger cohorts that is caused by lower birth rates. Even Prime Minister Lee Hsien Loong reckoned in one of his talks last year that the rapid aging of Singaporeans has an impact on the growth of the nation. He mentioned the government’s efforts to provide favourable work arrangements, health care services and housing benefits to inspire and cultivate a family-friendly culture in the country. Although the labour market is still striving for an ideal growth pace, Manpower Minister Lim Swee Say stressed last January that workers can still benefit from the scenario. His statement is not far from what MOM’s Singapore Workforce 2015 report disclosed: the nominal median monthly income, including employer CPF contributions, of full-time employed residents, rose over the year by 4.7% to $3,949 by June 2015. Experts also believe that the salary increase was triggered by competition for workers. The results of the “Key Household Income Trends, 2015” report released by the Singapore Statistics Department showed that the median monthly income for employed households was $8,666, a 4.9% increase over 2014. No income group was left behind since the lowest 20% of households experienced the fastest real income growth, with households in the lowest and 2nd lowest deciles recording growth of 10.7% and 8.3% respectively. “Productivity today is significantly higher than when we started in 2009,” said Deputy Prime Minister Tharman Shanmugaratnam, who is also chairman of the National Productivity Council (NPC). He suggested that having the same growth rate every year is rare. “It’s not that way in any country, for any length of time. It jumps up and down and it’s highly cyclical,” he added. Estimates by Ministry of Trade and Industry (MTI) reflect Mr. Shanmugaratnam’s claims. MTI calculated the Actual Hours Worked (AHW), a measure of labour input recommended by the International Labour Organisation for international comparisons of hours worked and productivity. The findings show that real value-added (VA) per AHW increased at a compounded annual growth rate (CAGR) of 2.9 per cent from 2009 to 2014. The issues circling the economy have not crippled the optimism of Singaporeans. Randstad Workmonitor Year-in-Review for 2015 reported that 67 per cent of the polled employees remained confident about securing a job at a different employer within six months. “We do not expect local employment to stay flat for an extended period of time as local employees’ up skill to fill the current skills gap, and fresh graduates with sought-after specialist skills enter the workforce,” said Jaya Dass, country director of Randstad Singapore. 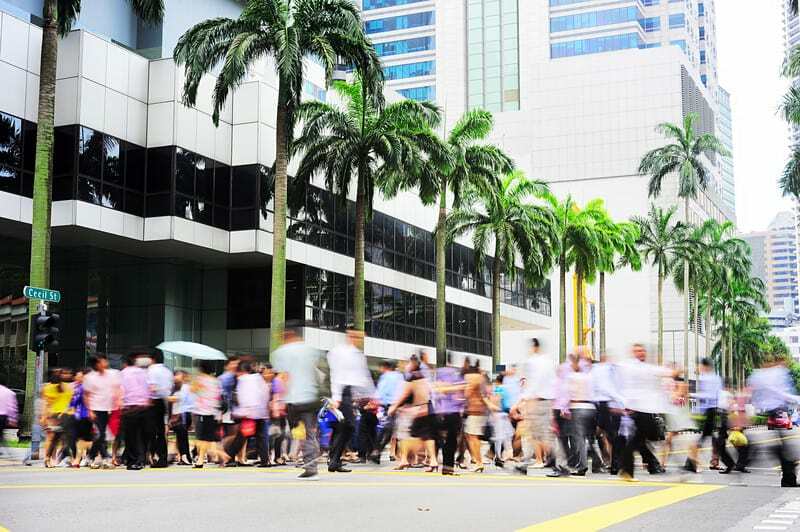 The employment outlook for Singapore is on an upward trajectory. The “Hudson Report: Forward Focus 2016” offered this bright conclusion after determining the sentiment of employers and job seekers. Numbers show that 41 per cent of the surveyed employers will increase headcount in the new year, and only 6% to decrease it while the majority (53%) plan to maintain current headcount. On the other hand, 34% of job seekers are actively looking for a new role and 40% are passively seeking one. The report also presented the reasons that keep employees attracted to a role and what makes them leave. Emmanuel White, regional director at Hudson Singapore, sees that organisations are planning for growth. “However, the more buoyant the economy, the harder it will be to attract people with the right skills and experience. In this market, there will be strong competition for talent,” he added. Hiring the best talents is essential for any business. As of 2014, there are 1.32 million foreign workers in Singapore. Most of them are employed in fields such as wholesale trade, food and beverage services, administrative and support services, and electronic, computer and optical products. In order to cool social tensions and focus on raising productivity, the government is working on slowing the inflow of foreign workers. A series of foreign worker levy hikes and stricter requirements is in the offing. For foreign workers in the construction, manufacturing, marine, process or services sector. The eligibility criteria for each sector vary. * The Dependency ratio ceiling will be reduced to 81.8% from 1 Jan 2016, and will be further reduced to 77.8% from 1 Jan 2018. The MOM website has a quota calculator to determine how many Work Permit and S Pass holders a company can hire. MOM is fully aware of fake certificates submitted by applicants to obtain work passes. The Ministry has tightened its policies and fraud detection protocols. Its efforts include more stringent internal database checks, use of third-party screening agencies, and direct checking of the certificate’s authenticity with the issuing educational institute. There are also stiffer penalties for those who will be caught with forged documents. The permits above do not apply to foreign entrepreneurs who want to start a business in Singapore. They should get an EntrePass, which requires them to first set up a private limited company with the Accounting and Corporate Regulatory Authority. At a conference organised by the Singapore Management University (SMU) and Singapore National Employers Federation (SNEF) on March 8, Minister of State for Manpower Teo Ser Luck emphasised that a tight labour market needs diversity at the workplace more than ever to bring together a variety of skills and perspectives. He also pointed out that employee selection should be based on merit and provide equal job opportunities for all Singaporeans. When telecommunications company Singtel revamped its employee benefits programme to cover not only incentives and health coverage but also career performance, it reported a 4% increase in net business profit with a constant increase in engagement scores: from 75 in 2013 to 76 in 2014 to 78 in 2015. Productivity and Innovation Credit Scheme – When businesses meet the qualifications, they can enjoy 400% tax deductions/allowances and/or 60% cash payout for investments made in any of the Six Qualifying Activities from the Years of Assessment (YAs) 2013 to 2018. Incentives in New Technology (INTECH) – Businesses can get co-funding for manpower development in the application of new technologies, industrial R&D, and professional know-how. There will also be 30% support for qualifying items for either trainee or training cost. Development and Expansion Incentive (DEI) – The requirement is a company’s plans for substantive commitments in manufacturing or growing leading-edge activities or capabilities in Singapore. The recipient can enjoy a reduced corporate tax rate on incremental income from qualifying activities. The government also introduced a program called SkillsFuture. Its thrust is to help Singaporeans develop and hone their skills, guide them in career decisions, and instill a culture of lifelong learning. Singapore has been taking bolder steps to appease labour woes particularly the hiring of foreign talent that affects the employability of many Singaporeans. One of the government’s actions is the establishment of tripartism in Singapore. This is the collaboration among unions, employers, and the Government: MOM, the National Trades Union Congress (NTUC) and Singapore National Employers Federation (SNEF). Their agenda revolves around job re-creation, raising the effective retirement age, training and upgrading the workforce, fair and progressive employment practices, and a flexible wage system. MOM launched the Fair Consideration Framework (FCF) to strengthen the Singaporean core in the workforce. Companies are required to advertise job vacancies on the Job Banks administered by the Singapore Workforce Development Agency (WDA) before they can submit Employment Pass applications. compliant with the Tripartite Guidelines on Fair Employment Practices. The Tripartite Guidelines on Fair Employment Practices aim to prevent discrimination in the workplace. It details the specific characteristics, methods, and standards companies should promote when hiring, conducting job interviews and creating job advertisements. the job is to address short-term contingencies. There are also additional requirements for companies to prove fairness in their hiring practices, such as organisation charts with nationality information, the framework for staff progression, and plans to develop local internal staff to take on higher roles or reduce reliance on EP holders. This clearly shows that whether you are an employed local, applying for a Singapore Employment Pass or setting up a company in Singapore, there are corresponding policies and programs you just need to know in order to enjoy government incentives and rewarding work opportunities. Ready to register your business in Singapore?